If you are thinking about changing jobs and moving to another city or country, working out the cost of living compared to the salary offered is often a challenge. 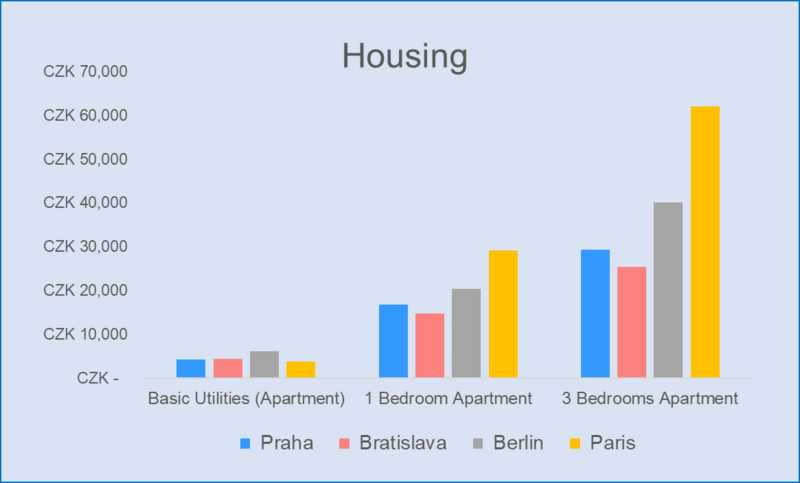 You can find informaton about basic costs of living in Prague in our previous article here. 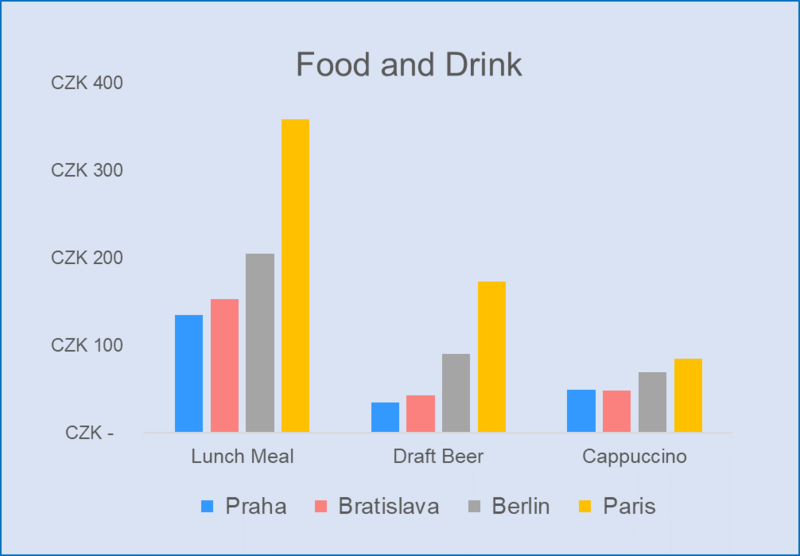 We decided to create a follow up article comparing the living costs and prices in four European capitals in Prague, Bratislava, Berlin and Paris. Prices of basic products in supermarkets are generally lower in the Prague than in neighbouring countries. But what is the price of restaurant lunches or the legendary Czech beer? Lunch menus range from 100 to 150 CZK. Beer is about 30 CZK. There are also many great cafes in Prague offering very good quality coffee. Most cafe’s have free wifi allowing your to surf and slurp, or work in a relaxing location. Local guide tip: Czech beer is famous all over the world, but try some of the less well known brands. The Czech Republic is home to an ever expanding market of micro-breweries and craft beer pubs where beer produced at high quality and low cost. Do you go swimming in the mornings or visit the cinema every Thursday? There are many Prague swimming pools offering indoor and outdoor swimming for the public. You can expect to pay 100 to 150 CZK for a 2-hour visit. Cinema tickets cost an average of 150-170 CZK. Most cinemas show new movies in their original language with Czech Subtitles. Local guide tip: Prague has a lot of multiplex cinemas but for an alternative experience, try to find some of Prague‘s smaller cinemas offering an interesting program mostly in the film’s orginal language, in unique classic cinema buildings and courtyards. 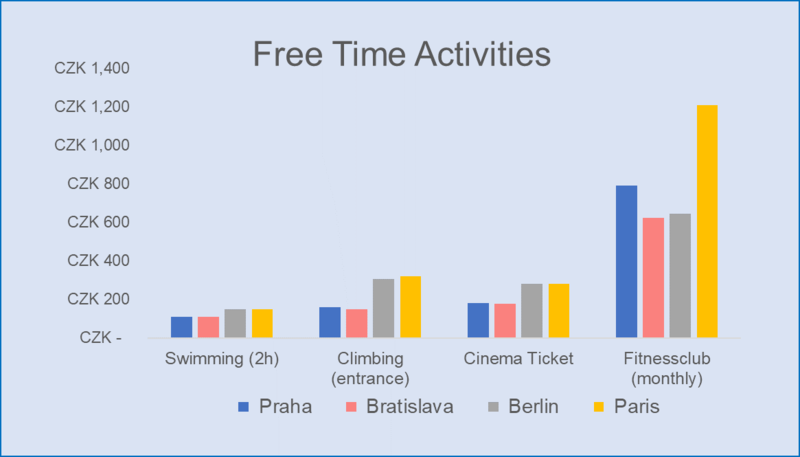 As you have noticed, living costs in Prague are lower than in other European capitals. Salaries are lower too in a lot of cases. 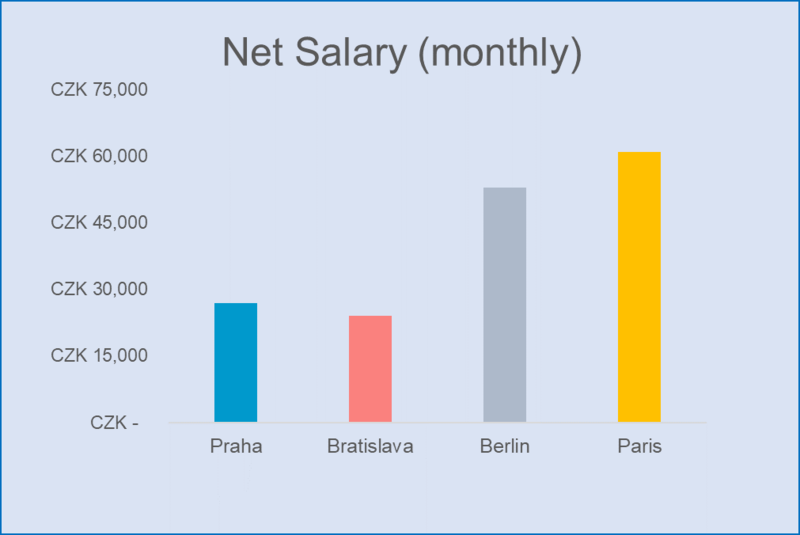 In conclusion, we compared the average net wages in Prague, Berlin, Bratislava and Paris. Prague is a great place to live, if you’d like to experience it, the choice is yours! You can find the available multilingual vacancies under the Jobs tab or right here in the link.